Do you feel too ashamed to remove your shoes in public because of cracks in your heels? While we spend a lot of time caring for our face, our feet are mostly ignored. It is this lack of care and hygiene that causes your heels to crack. If that is the case, we have got you covered. Your kitchen is a treasure trove of amazing products with medicinal value that can treat many daily ailments, including the problem of cracked heels. Prepare a mixture of one cup of Listerine, one cup of white vinegar, and 2 cups of water. Soak your feet in the mixture for 15 minutes. 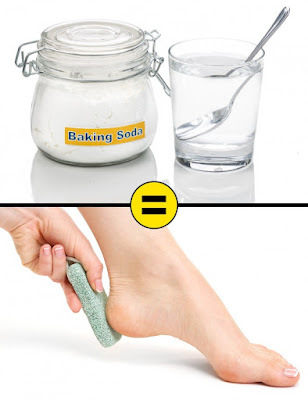 Remove your feet, and scrub them using a pumice stone to remove dead skin. How often: Repeat every day until your heels heal. 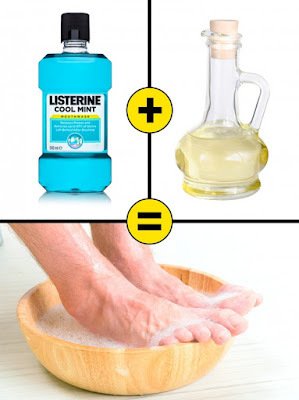 Why it works: Listerine contains thymol and alcohol, which help to fight toenail fungus, cure cracked feet, soothe skin, and treat plantar warts. The mild acids present in vinegar soften dry and dead skin, making it easy to exfoliate. Make a scrub by mixing 3 tsp of rice flour, one tsp of honey, and 2–3 drops of apple cider vinegar. Stir well to form a thick paste. Soak your feet in lukewarm water for about 10 minutes, and then gently scrub using the paste to remove dead skin. How often: Repeat the process 2–3 times a week. Why it works: Rice flour exfoliates, purifies, and remineralizes the skin. Honey is a natural antiseptic that helps heal cracked feet. Vinegar is a mild acid that softens dry and dead skin, making it easy to exfoliate. Mash 2 ripe bananas into a smooth paste. Make sure that the bananas are ripe. Unripe bananas contain acid that is harsh for the skin. Gently rub the paste all over your feet, including the nail beds and sides of the toe. Keep it on for 20 minutes. After 20 minutes, rinse your feet with clean water. How often: Repeat this every night before going to bed for 2 weeks or until you are satisfied with the results. Why it works: Banana is a natural skin moisturizer. It contains vitamins A, B6, and C, which all help to maintain the elasticity of the skin and keep it hydrated. Add one cup of honey to a tub of warm water. Soak your clean feet in the mixture, and gently massage for 20 minutes. Gently exfoliate your skin using a pumice stone. Pat your feet dry, and apply a thick moisturizer. How often: This can be done regularly before going to bed. Why it works: Honey is a natural humectant, meaning it draws water from the inner tissues to the outer layers of the skin. This fluid shift creates a plumping effect that helps the outer skin heal. Dry your feet using a soft towel. Apply a thick layer of vegetable oil to your heels and toes. Put on a pair of clean comfortable socks, and leave them overnight. How often: Daily before going to bed. Why it works: Vegetable oils are readily absorbed by the skin. Most vegetable oils contain vitamins such as provitamin A, D, and E, which all help nourish the skin and create new cells. Before heading to bed, apply a generous layer of Vicks VapoRub to your feet. Massage for 5 minutes, and then put on comfortable socks (preferably cotton). Wash your feet with lukewarm water the following morning. Why it works: Vicks VapoRub contains camphor, eucalyptus, and menthol in a turpentine oil base. This type of ointment is emollient, thereby trapping moisture. The menthol and eucalyptus provide a cooling effect. Add 3 tbsp of baking soda to a bowl of lukewarm water. Mix well until the baking soda dissolves. Soak your feet in this for 15 minutes. Remove your feet, and scrub gently with a pumice stone. Rinse with clean water, and dry your feet with a clean towel. How often: Repeat the procedure twice a week. Soak your feet in warm water, and scrub using a pumice stone to remove dead skin. Pat dry, and apply a thick layer of aloe vera gel to your feet. Wear cotton socks, and head to bed. Wash with lukewarm water in the morning. How often: Repeat this every night for 4–5 days to see the results. Why it works: Aloe vera contains vitamins A (beta-carotene), C, and E. These have antioxidant properties while the cholesterol, campesterol, β-sitosterol, and lupeol contained in aloe vera have anti-inflammatory properties. Lupeol also acts as an antiseptic and analgesic. The auxins and gibberellins present in aloe vera help in wound healing. Soak your feet in warm water for about 20 minutes. Rinse, and pat dry. Add 3–4 drops of freshly squeezed lemon juice to one tsp of Vaseline. Mix well. 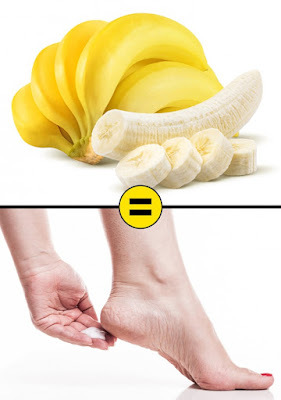 Apply this mixture to your heels and other cracked parts of your feet. Wear a pair of woolen socks, and let it sit overnight. Wash using warm water in the morning. How often: Regularly before going to bed. Why it works: Vaseline acts as a moisturizer, and the citric acid in lemon juice promotes skin peeling and regrowth of new skin cells. Add half a cup of Epsom salt to warm water in a foot basin. Soak your feet in it for 15 minutes. Scrub to remove dead skin. How often: 2–3 times a week. Why it works: Epsom salt reduces inflammation and softens skin. The sulfates help flush toxins and heavy metals from the cells, easing pain and helping the body to eliminate harmful substances. Instead of popping pills, it is always recommended to follow natural remedies. Many such remedies can be found in our kitchen.